Into The Deep: In Memoriam: Rev. Paul J. Landolfi, S.M. 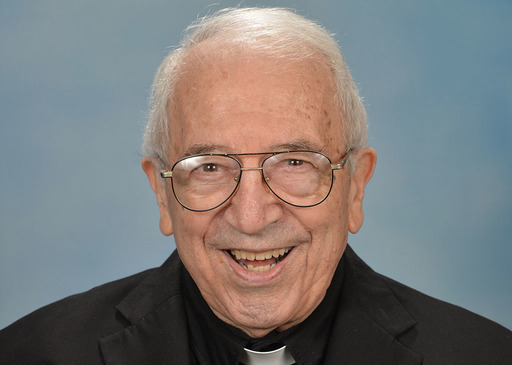 The Marianist Community and the entire Chaminade Family mourn the passing of Rev. Paul J. Landolfi, S.M., 90. Fr. Paul died peacefully at the Queen of Peace Residence in Queens Village Thursday. He was praying the Memorare with several of the brothers when he returned to the Lord. A wake will be held in the Chapel of Our Lady's Assumption at Chaminade from 3-8 p.m. on Sunday, Nov. 19. A Funeral Mass will take place in Chaminade's Darby Auditorium on Monday, Nov. 20 at 10:30 a.m., followed by burial at Holy Rood Cemetery in Westbury. Fr. Paul came to Chaminade during the 2012-2013 school year. In 2015, he celebrated the 60th anniversary of his ordination to the priesthood. In essence, he was a Marianist his whole life. Fr. Paul was raised at the St. John's Residence for Boys in Rockaway Park – an orphanage operated by the Society of Mary. His priestly ministry would bring him back to St. John's in later years; he was also a member of the St. John's board. When the Marianists left St. John's in 2012, Fr. Paul thanked the many people he met for collaborating with the brothers to make a difference for orphans. "For all this," Fr. Paul said in a homily, "we thank our God, for this was the way we Marianists at St. John's were able to glorify our God and be of real service to our boys. This was our calling. Ask the Alumni what St. John's means to them! Don't overlook the tears of more than a few as they left the Home and you will realize the good God enabled us to do for them. And you helped us do this." That sensitivity to the spirituality of young people was instantly apparent when Fr. Paul came to Chaminade. Students got to know Fr. Paul as a Sodality and retreat moderator. Fr. Paul's compassionate and understanding nature was particularly evident to anyone who received the sacrament of reconciliation. He was a holy man in the purest sense. Chaminade's brothers came to view Fr. Paul as a "father figure" in his years with the Marianist Community. He had many friends who would look to Fr. Paul for spiritual direction and guidance. In fact, Fr. Paul organized an evening of recollection on the 100thanniversary of the apparitions of Our Lady of Fatima. Devoted to Mary, he was inspired to gather as many people as he could for an event centered on the rosary. That was in October – just one month ago, and just two months after Fr. Paul was diagnosed with a form of leukemia. While the disease began to affect his body, his spirit showed no signs of frailty. When the brothers made the difficult decision to bring Fr. Paul to Queen of Peace Monday, Bro. Stephen Balletta, S.M., director of the Marianist Community at Chaminade, told faculty and staff, "He is a beloved member of our Community – an elder statesman, an expert on all things Marian and Marianist, a kind and compassionate soul, and a true son of Mary." His final moment reaffirmed that. Fr. Paul shared a message with the St. John's community that may be especially poignant on this day: "The Marianists came here representing Mary, the Mother of Jesus, to whom they dedicated their lives. Our mission was to educate our boys, to help them grow up to be mature young men, just as Mary had done for Jesus . . . She will always keep us focused on her Son, Jesus, who keeps reminding us of the promise: I am with you always, even to the end of the world. It is in His power, His Name, and His Mercy that we trust for the future."